When my husband, Dana, was a kid, his mother fixed plum pudding every year at holiday time, steaming it endlessly in a pan on the stove and topping it with gobs of homemade hard sauce. Young Dana did not care for that hard sauce at all, so just mention “plum pudding” to him and see the trials of childhood in his eyes. Later in life, when Dana found out that “hard sauce” was “frosting,” plum pudding became much more tolerable. One year I wanted to make soft hanging ornaments for my friends, so I asked him to draw me some holiday-like shapes. Guess what issued from his pencil… a fat plum pudding, replete with dripping hard sauce! 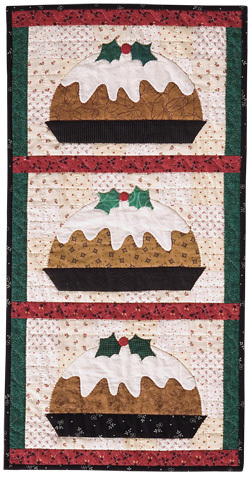 When I pulled together my book of holiday designs, I made sure to include that plum pudding! Here’s my version, hand appliquéd on a patched background. I have a book of designs called A Merry Little Christmas to Appliqué that’s filled with festive designs in incremental sizes that play nicely together. Since it’s now a week until Merry Merry Day, I’ve decided to post a bunch of those Christmassy appliqué quilts between now and then. 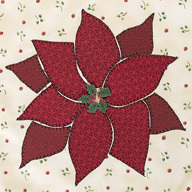 Pam Crooks made a beautiful repeating poinsettias quilt using rich batiks. When she was planning this project, she emailed and asked how I felt about fuchsia. 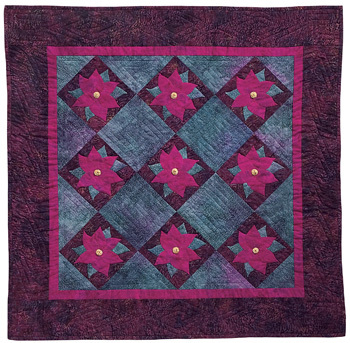 I replied, “Gotta love the fuchsia!” so this elegant wall quilt was born. Karen Garret made an apron to wear at holiday time and decorated it with the same poinsettia pattern. She did a neat stylizing thing with it, and added sew-on decors. There wasn’t room in the book to show the whole apron, so we just showed the poinsettia.